A social media proposal, or social media plan, is something you would be searching for, if you are an agency or a freelancer offering social media marketing services. Social media is everywhere. With this powerful medium, every business is trying to increase its brand awareness and wants the customers to be engaged with their brand. But to get a potential client or small business, what you need is an enticing social media proposal to acquire business. You need to consider some basic traits while crafting a proposal for client. Addressing those key elements in the proposal, you can come up with a proposal that can be a big shot success for you. What has been your experience on social platforms and technologies? How your campaign management makes you different from others? What other marketing exposure adds more value to your social media expertise? Which businesses you have catered so far, whether big or small business, list down that experience. We provide a social media plan template for small business before. A social media plan template is incomplete, if it is unable to state about marketing goals and objectives. Remember that you are going to design a proposal depending upon the target client or company/s requirements. So,the goals vary accordingly. You must specify the social media and business goals in details. Whether the client wants an increased fan base and user engagement. Or the company focuses on generating leads. Once, the goals and objectives are clear, you are ready to hit the market with the right strategy. It is a very critical ingredient of any proposal. What is the target niche or industry of the client? Give clear specifications about target audience in your proposal. You can consider various elements of audience while devising the marketing strategy. Where the audience is located, what are their interests (like reading articles, playing games etc.) and age group – all these various aspects are important while analyzing the audience. What social channels and sites you are going to focus? In order to give client an overview, list down the major platforms that you will be using in your social media strategy as well as the tools (like Hootsuite, Fan Page Robot etc. )to be used for tracking and monitoring purposes. You have to furnish the proposal with a thorough social media marketing strategy. Or you can call it simply an ‘Action Plan’ with every detail including, social channels, thorough blog strategy, time allotted, type of content and key actions that are required to be taken. How your company is going to manage the entire social media campaign and activities? With the insights of your team members and their roles, a client is also made aware of the workflow of process and responsibilities of every contributor. 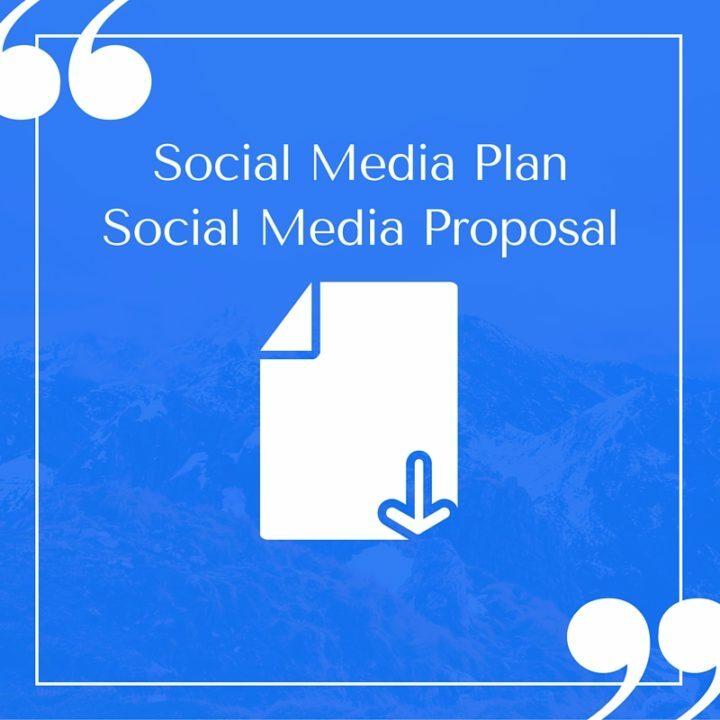 For your easiness, a compelling social media proposal template for big or small business is devised with all the key ingredients as discussed above. You can easily customize this template as per your requirements. Download now for free (in Word). No string attached! Good luck!